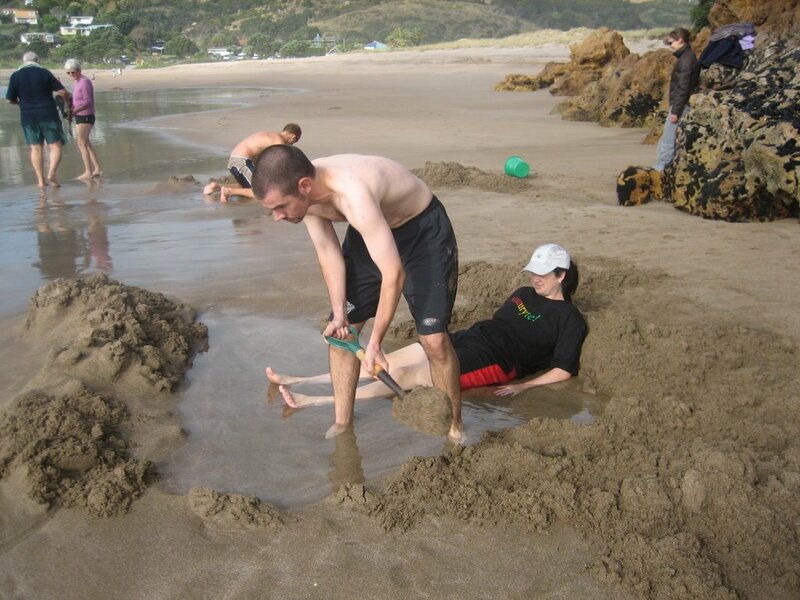 During our visit up the east coast of the Coromandel Pennisula to Hahei and Cathedral Cove, we jumped at the chance to participate in a true New Zealand experience: digging your own jacuzzi at Hot Water Beach. It is on this small stretch of beach that thermal waters bubble just below the sand between a rocky outcrop and the Pacific Ocean. As a result, if you arrive at low tide and dig down, you can create your own hot tub in the sand. At least that's the theory. After picking up a spade from our guesthouse we went a digging. It was certainly warm. VERY warm. VERY VERY warm. As a result we spent most of the time digging little holes farther and farther away from the geothermal source and shifting positions trying to keep the hot and cold water regulated. We had varying success though your loyal scribe ended up with two crispy elbows after keeping my self propped up a wee bit too long. It certainly was a popular location though; by the time low tide actually came (we'd shown up about an hour early) there were between 35-45 people in various pools about a foot or so in depth (dig much deeper and you get the 60 degree Celsius (~140 deg F) water). We'd hate to see what it's like during peak season though I could imagine spade jousting would be prominently involved. Not quite a jacuzzi in the sand but more like a lobster being boiled for dinner. But still a unique New Zealand experience.